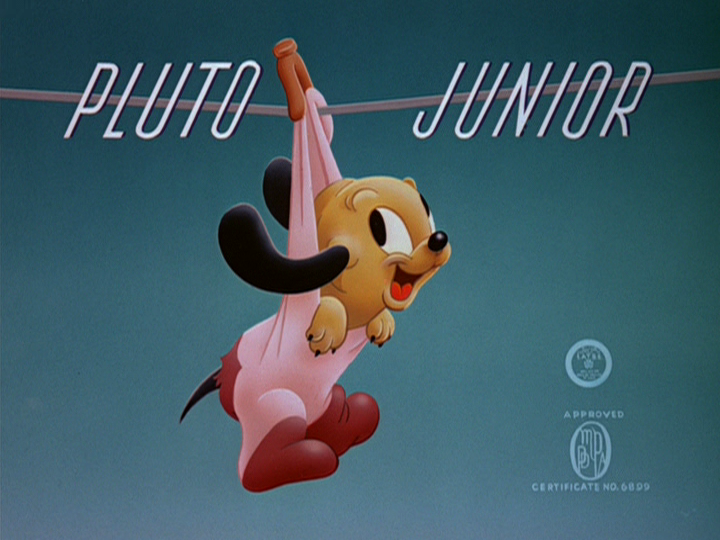 Pluto, Junior, a Pluto short film, was released by the Disney Studios on February 28, 1942. Directed by Clyde Geronimi and with the voice talent of Pinto Colvig, the short shows a different side of Pluto as a father to a rambunctious puppy that is so much like him in curiosity and ending up in precarious situations. The short opens on a sunny day, and snoring is heard as the audience sees a ball rolling back and forth across the lawn. As the camera zooms out, we see Pluto and Junior, fast asleep in their respective doghouses, with the ball rolling in between their snores. Pluto’s snore is a bit too strong, and pushes the ball straight into Junior’s nose, startling him awake. Eyeing the ball bouncing up and down, Junior decides that it’s playtime, only to end up being more bullied by the ball than actually playing with it. The ball slips and lands in Pluto’s mouth, who ends up choking on the toy. Seeing his father awake, Junior barks enthusiastically, hoping his father will want to play. Pluto, however, is too tired, and angrily growls at the puppy, scaring the poor thing. 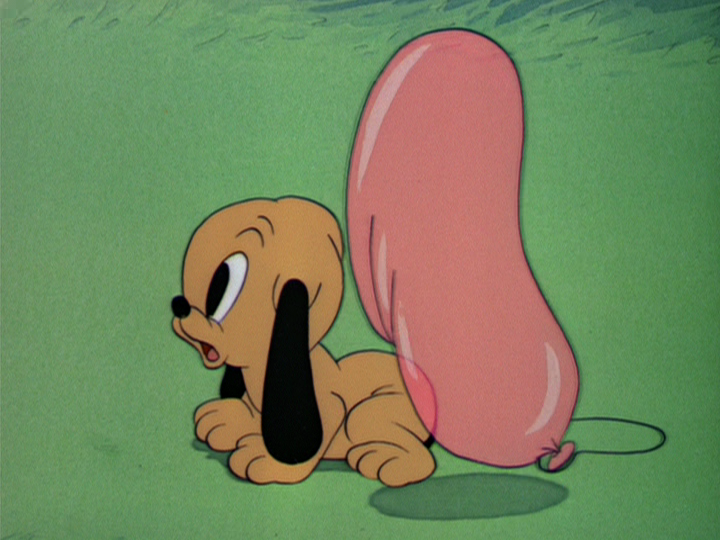 As the puppy rolls backward from trying to get away from Pluto, he ends up rolling onto a balloon, which sticks to him and causes his ears to stand up from the static electricity. Curious, he turns around to sniff the balloon, and ends up trying to attack it, only to pull away the string and let the balloon fly across the yard, landing in Pluto’s mouth. Pluto unwittingly fills the balloon with air as he snores, and Junior, now thinking the balloon is an enemy, tries to sneak up on it, only to be scared of his own growing reflection in the balloon. Junior finally gets the courage to bite it, and it explodes. The sound makes Pluto shoot through the roof of his doghouse. Junior, meanwhile, ended up in a patch of dandelions from the force of the explosion, and when he sneezed away the dandelion fluff, a worm landed on his head, and is not happy about his new location. Junior tries to pull the worm from his face, only to have it stuck in more humorous positions, such as around his eye like a monocle. Junior finally flings the worm away, and goes after it like a shot, determined to fight it. The chase goes all over the backyard and up a tree, where a hungry bird is waiting to devour the worm. As the bird tries to chase the worm, it accidentally grabs a hold of Junior’s tail, and Junior angrily chases the bird in revenge. The bird flies around with Junior on its tail, until the puppy falls and lands into a sock on the laundry line, with only a feather as his spoils of war. He looks down to see that the ground is so far away, and begins yelping helplessly. Pluto wakes to see Junior in his precarious position and rushes to try and save him. As Pluto pulls on the laundry line, the line stops when a knot prevents it from moving. Pluto tries his best to get the line to move, and finds himself being carried out on the line and having to walk it like a tightrope. After one daring swing, he ends up flying through the air and landing in some socks, only to have the socks snap away from their pins. Pluto then uses his tail to stay on the rope, and Junior, impressed, begins to cheer his father on. Still trying to rescue the pup, Pluto tries to pull his way down the laundry line, until Junior is right on top of him. Unfortunately, Junior’s enthusiastic wagging hits Pluto’s nose, and he lets out a mighty sneeze, sending both of them into the laundry tub. At the 14th Annual Academy Awards, held on February 26, 1942, at the Biltmore Hotel in Los Angeles, it appeared to be a banner year for the Walt Disney Studios. Although Fantasia had not been the commercial success Walt had hoped it would be, it had still been a major innovation when it came to the process of sound in motion pictures. At his awards ceremony, Leopold Stokowski, the conductor of the film, was awarded a special Academy Award; a special Academy Award was presented to Walt Disney, William Garity, John N. A. Hawkins, and the RCA Manufacturing Company for the film, as well. On top of this, Walt Disney was fourth recipient of the Irving G. Thalberg Memorial Award. The Irving G. Thalberg Award honors those “creative producers whose bodies of work reflect a consistently high quality of motion picture production.” It honors Irving Thalberg, who, at the age of twenty-three, became the vice president and head of production for Louis B. Mayer. Before he died of pneumonia at the age of 37, his work had made MGM one of Hollywood’s most prestigious studios. 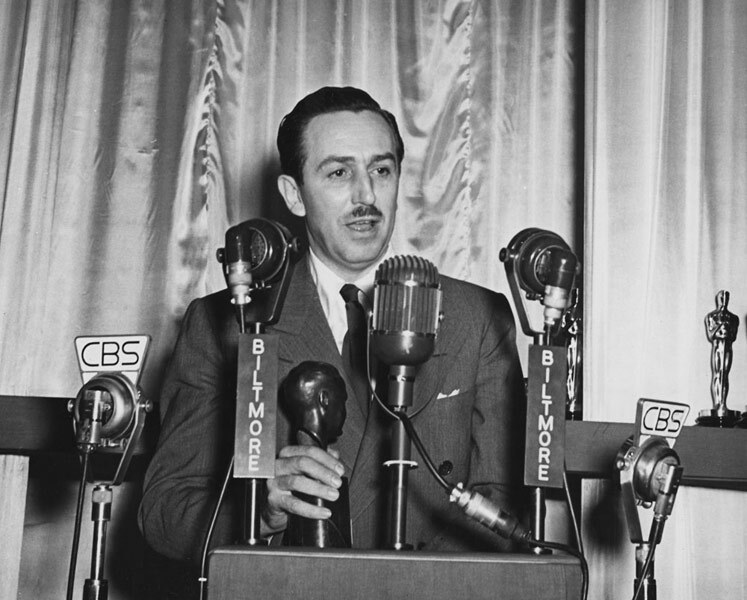 Disney became the fourth recipient of the award, and although he only had about three feature films and several shorts under his belt, it showed that Disney had made many strides in the fields of animation and motion pictures. 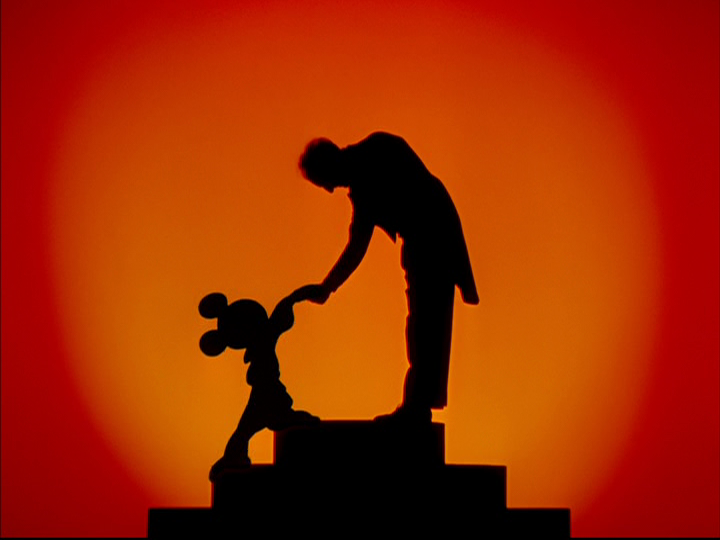 Leopold Stokowski and his associates were given a special award by the Academy “for their unique achievement in the creation of a new form of visualized music in Walt Disney’s production, Fantasia, thereby widening the scope of the motion picture as entertainment and as an art form.” The other special award—given to Disney, technicians William Garity and John N. A. Hawkins, and RCA—was for “their outstanding contribution to the advancement of the use of sound in motion pictures through the production of Fantasia.” The RCA stereo system that had been honored was truly remarkable for its day, and helped create a concert-like atmosphere for the audience. It was a very expensive system, requiring special equipment to be installed in theaters, which meant that the film originally opened in only 14 theaters. Posted in Uncategorized and tagged 1940s, Academy Award winning, Technique. Bookmark the permalink. 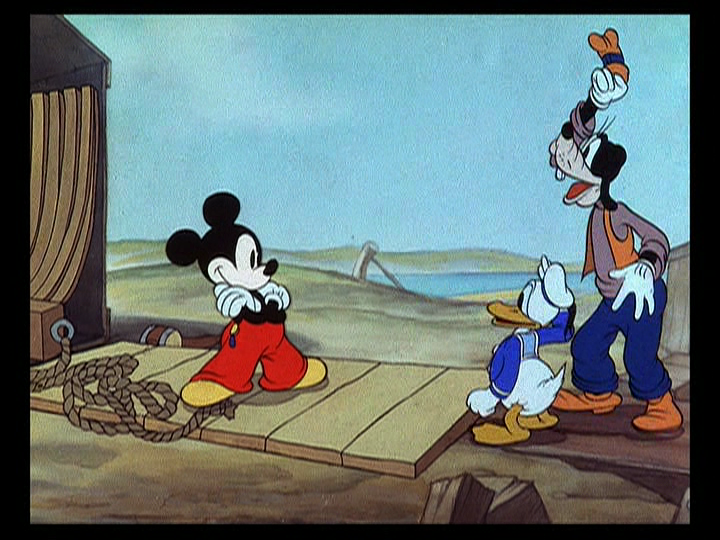 On February 25, 1938, the new Mickey Mouse short, Boat Builders, was released to theaters. This is another one of those shorts where the comedy is actually found through the actions of Goofy and Donald, rather than through Mickey’s actions. 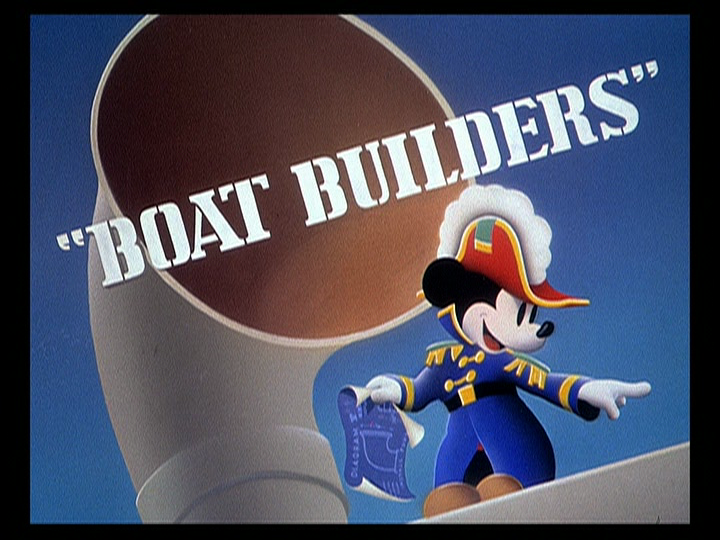 Directed by Ben Sharpsteen, Boat Builders featured the vocal talents of Walt Disney as Mickey, Pinto Colvig as Goofy, Clarence Nash as Donald Duck, and Marcellite Garner as Minnie Mouse. The short begins with Mickey, Donald, and Goofy excited about building a boat from a kit they have ordered, especially after turning the page and seeing a picture of what the finished project should look like. It’s easy, too: The included instruction manual taunts that “Even a child can do it.” Mickey declares that once she’s built, they will call her The Queen Minnie. The boys set to work opening crate number one, labeled the keel and ribs, merrily whistling (and quacking, in Donald’s case), sea shanties. Grabbing the rope, they pull out the collapsed innards of the boat, only to have the boat chase them down the shore and capture them on the beams. 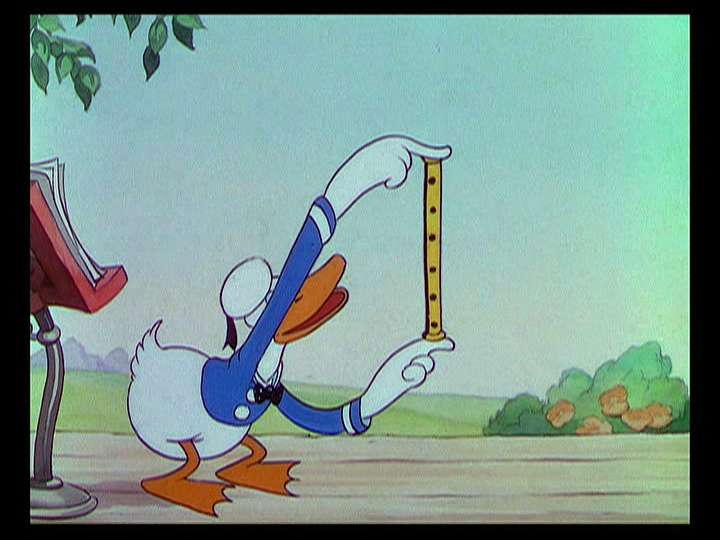 Mickey laughs when he recites the simple instructions once again, and Donald laughs with him when he reminds them of the boast that even a child can do it. 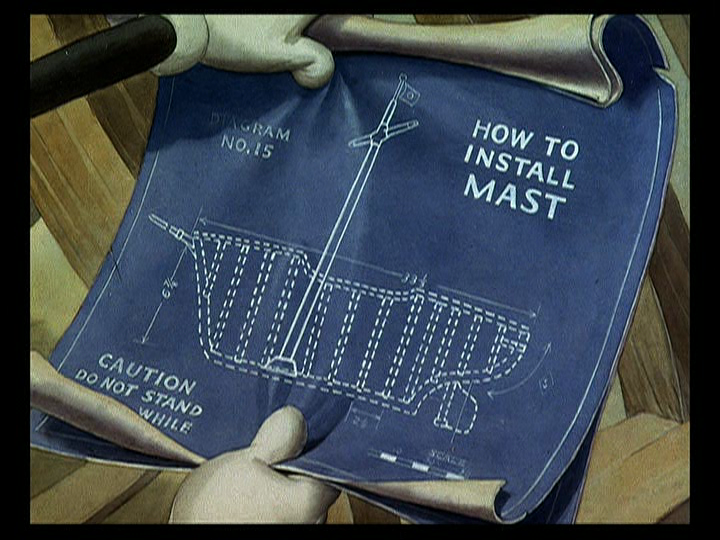 The scene then moves to Mickey picking up the box with the mast enclosed and pulling out the blueprints on how to install the mast. When Mickey stands on top of the mast, trying to pull it out, it shoots out of the box, sending Mickey all the way up to the sky. The mast is then assembled with Mickey, still hung up at the top of the mast by his clothing, saluting the audience. Assembling the boat is quick work for the three, and Goofy is seen hammering nails into the sideboards, although, as is usually the case with Goofy, the board does not want to stay nailed down, and hits Goofy square in the head. Slightly angry, Goofy grabs another set of nails and hammers it down again, only to have it swing back at him. Goofy ducks, but it hits him on its swing back. He then feverishly hammers the board down and turns to another task, but continues to be taunted by the board. It finally hits him, spinning him until he falls onto his barrel of nails. 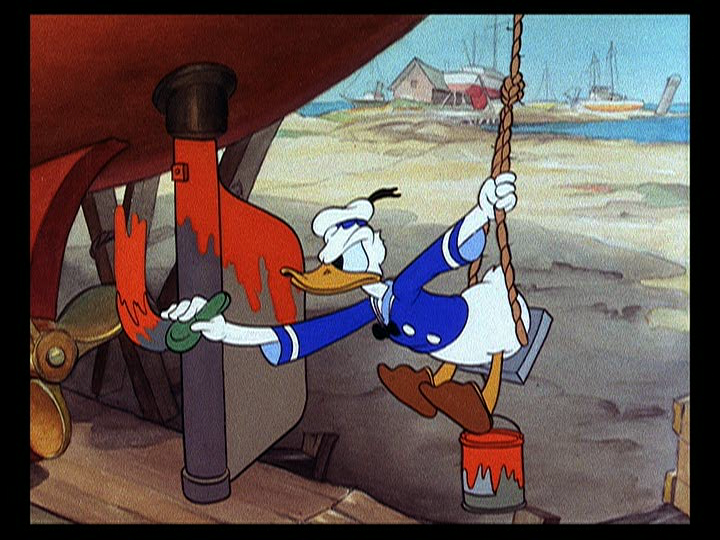 Mickey and Donald continue putting the boat together, with Donald painting the rudder, not noticing that Mickey has just placed the helm into its socket and is testing it, causing Donald to completely miss the rudder while trying to paint. Donald holds it still, causing Mickey to think that the wheel is now stuck, and as he tries to free it, Donald gets wrapped around the rudder like a tetherball, and then is hit like a ping-pong ball as Mickey continues to pull on the helm. Goofy sets about to add the figurehead to the boat, but when he opens to see that it’s in the shape of a beautiful mermaid, he closes the box, flustered, thinking that there’s an actual lady enclosed. He tries to straighten himself up a bit more, and knocks on the lid, apologizing to the figurehead. When it falls out of the box, Goofy catches it, alarmed, and calls out to the others that she’s fainted. He puts her in a beach chair and asks if she’s feeling better, but of course, she doesn’t say a word. 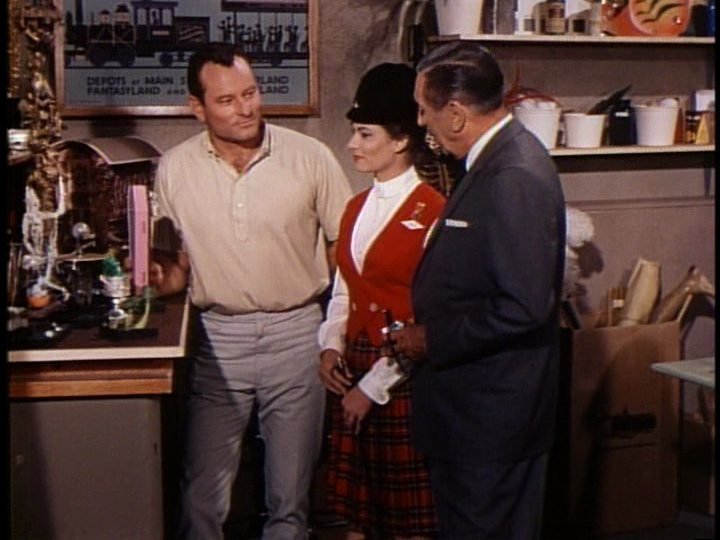 “Gee, but you’re purty,” he tells her, twisting his hat in embarrassment. As he admits he could fall for a girl like her, he accidently steps on her tail, pushing the figure up and meeting him in a “kiss,” which causes him to spin around giddily. 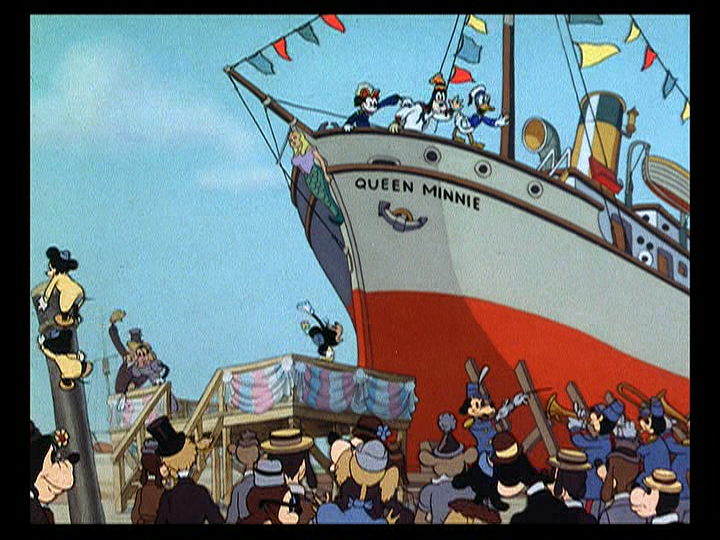 While Goofy hides his head, giggling, Mickey takes the figurehead and places it in the front of the boat. Poor Goofy is alarmed to find that she has disappeared, and begins to search for her, but ends up falling off the boat and pulling down the anchor. Posted in Uncategorized and tagged 1930s, Color, Mickey Mouse, Short film. Bookmark the permalink. After the success of Toy Story, which provided more income to the once-struggling Pixar Studios, a new agreement was signed on February 24, 1997, for a new five-film deal. 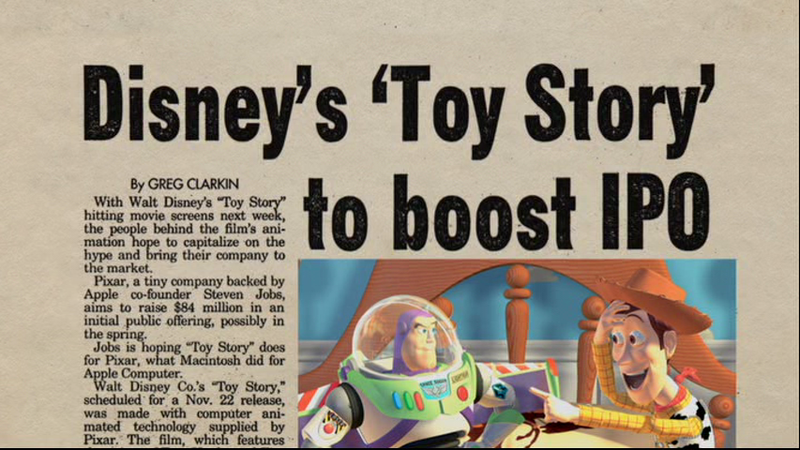 This deal gave Pixar more of an equal share of the assets from their films. This extended deal only served to further prove that Pixar had something amazing to offer Disney and the film industry in general. When Pixar signed the first three-film contract with Disney in 1991, the studio was cash-strapped and needed the deal, so they had agreed to a 10 to 15 percent share of their films’ profits so that Disney would fully finance the films. This left most of the profits and merchandising with Disney. “Financially, if one film did not do well,” Steve Jobs explained about the first contract, “we would be wiped off the face of the planet.” Jobs began to push Michael Eisner for a new contract a few months after the release of Toy Story, when he was confident in the film’s success both commercially and as a groundbreaking achievement for Pixar. Jobs realized at that point that Pixar needed to become a studio, instead of a production company, and to accomplish this, they would need capital. 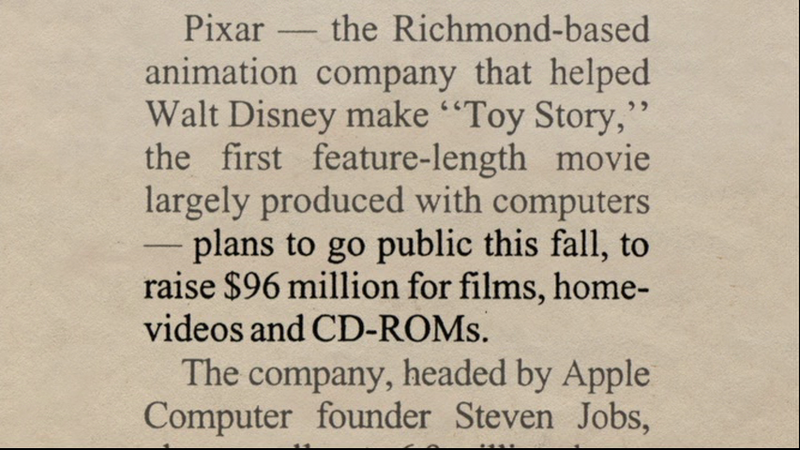 Their best option was to go public, and Pixar became the highest initial public offering (IPO) of 1995. Toy Story had given Pixar a massive success, and with the added bonus of their IPO, Pixar was able to co-finance their films, work on getting a higher percentage of the films’ profits, and get the proper credit for their work. Jobs offered Eisner the one bargaining chip he had: more films. Eisner could not say no, and in 1997, Pixar’s Chief Financial Officer, Lawrence Levy, and the similar representative for Disney, Robert Moore, signed a 42-page contract for five feature films (the first one being A Bug’s Life, which was beginning production and still known as Bugs), in which the production costs would be split 50-50, and Pixar would receive 50 percent of the profits, along with home video and tie-in product receipts, and equal advertising with Disney for the films. When Jobs and Eisner announced the extension of the contract, the Pixar stock jumped 50 percent. 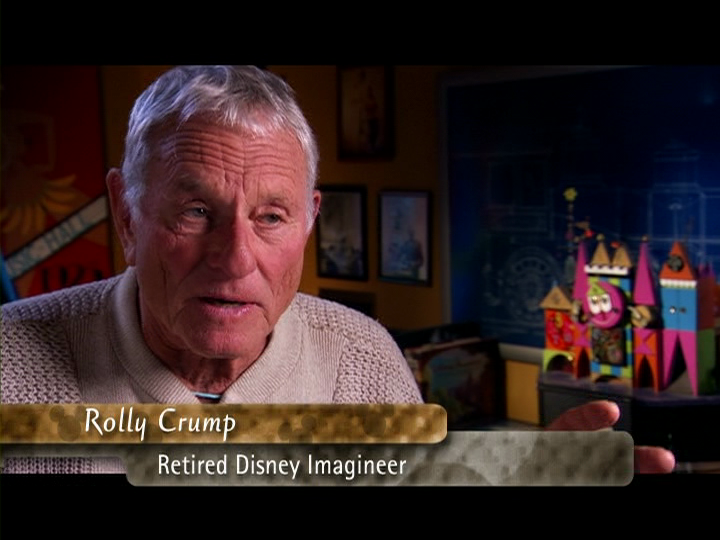 Posted in Uncategorized and tagged 1990s, Disney, Pixar. Bookmark the permalink. 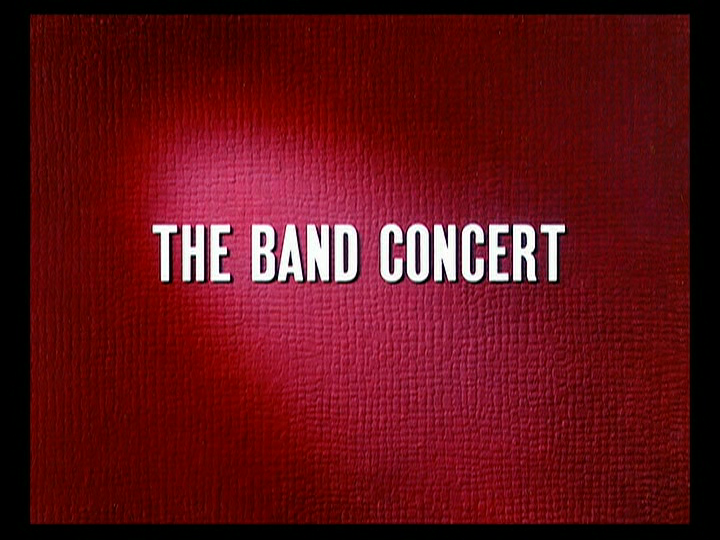 “Yet, in a funny way, The Band Concert spelled the beginning of the end for Mickey as a solo cartoon star. As good as he is in this film, and his range of expressions as the frustrated conductor is marvelous, his thunder is easily stolen by a newcomer on the scene, Donald Duck.” – Film Critic Leonard Maltin. On February 23, 1935, audiences flocked to see a new Mickey Mouse short, only this time, it was in Technicolor. 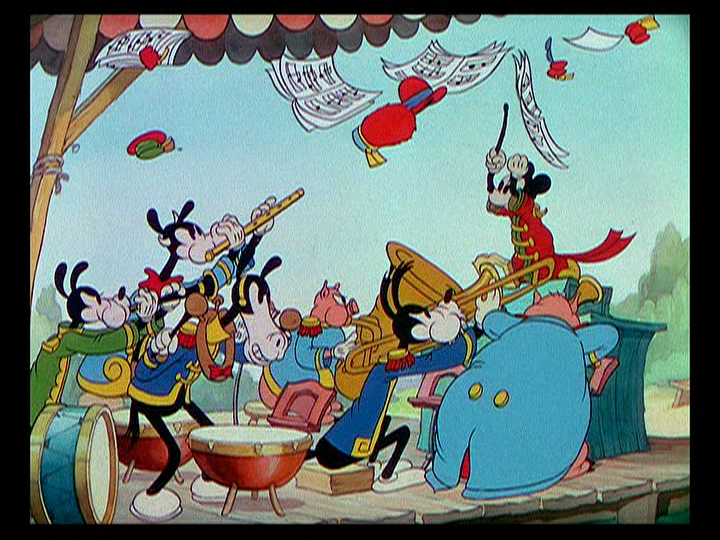 The Band Concert, Mickey’s first color short film, would not go on to win an Academy Award, but has been hailed as one of, if not the, best Mickey Mouse short of them all. From this point on, with the exceptions of Mickey’s Service Station and Mickey’s Kangaroo, all of the Disney shorts would be in Technicolor. 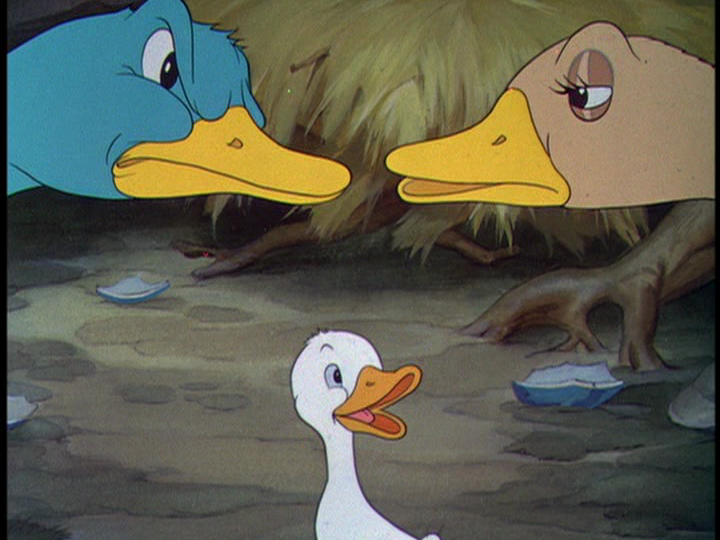 The short also boosted the popularity of Donald Duck, who was considered to be a funny character, as opposed to Mickey’s charming personality. The film was directed by Wilfred Jackson, and has Clarence “Ducky” Nash with the only speaking role in the film as Donald. ­­­It has been noted that orchestra conductor Arturo Toscanini considered this film his favorite; it has also been said that the short film Symphony Hour (1942) may have been a more outlandish remake of this film. The camera moves to the distraction, and we see Donald Duck pushing an ice cream cart, with lemonade and bags of popcorn for sale as well. He stops to admire the music, then pulls a flute from the front of his uniform, wanting to join in with the orchestra. In the middle of the William Tell Overture, Donald begins to play Turkey in the Straw, which gets the orchestra to switch to the similar sounding tune. When Mickey notices the switch, he grabs Donald’s flute and breaks it in half, but Donald has another trick – or flute, rather – up his sleeve, and resumes his tune while Mickey tries to bring the concert to a halt. With a wink, Donald presents another flute as the orchestra tries to get back on track, and when an aggravated Mickey tries to break the third flute, Donald decides to do it for him, sending the audience into peels of laughter. Mickey, at wits’ end, lunges at Donald, only to land on his face as the duck speeds off the stage. With renewed vigor, Mickey pulls the orchestra back to the assigned piece. As they begin to play, Donald, hiding behind a music stand, pulls out another flute, only to have the trombone player encircle the duck’s neck with the trombone slide and shake him down, revealing all the flutes Donald had hidden away, before throwing him right onto his cart, spilling food everywhere. Donald throws a tantrum, but the trombonist just laughs. Donald grabs one of the flutes from the shake down and begins his takeover attempt again, not noticing a bee buzzing around him curiously. 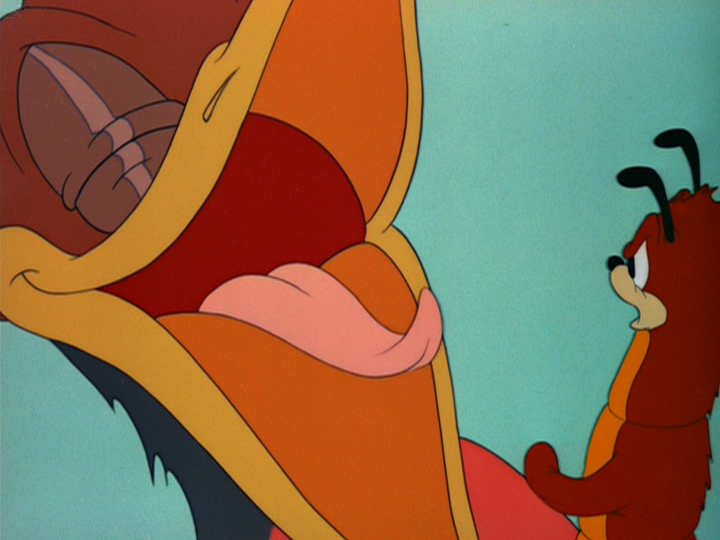 The bee flies into the flute, and ends up in Donald’s mouth, causing the duck to have another fit. When the bee flies away and lands on Mickey’s hat, Donald grabs an ice cream cone and throws it in the insect’s direction. The ice cream lands in a trumpet, and the trumpeter blows it out, which hits Mickey on the back of the head. As Mickey tries to shake the ice cream out, directing the orchestra along the way, the classical piece gets a somewhat interesting interpretation, and Mickey’s temper flares again. As Mickey finally gets the orchestra back on track, the bee returns and buzzes around Mickey, and each move the mouse makes to swat it away is interpreted by the orchestra as his direction with comical results. The bee buzzes around Horace Horsecollar, playing percussion, who tries to swat him with the cymbals, only to crash around Goofy’s head. 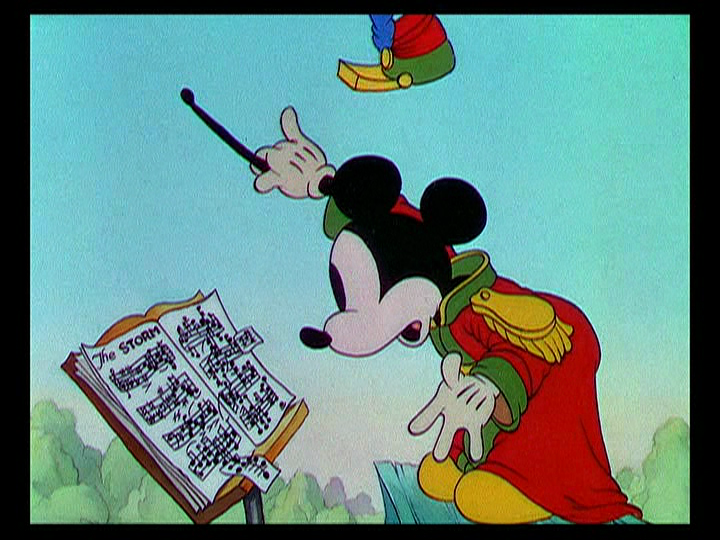 Mickey turns the page in his music book to the part in the overture called The Storm. He looks rather surprised at how complicated the piece is, but is determined to play it and play it well. When the orchestra starts to play, the clouds get noticeably darker, and the wind begins to blow ominously. Without warning, a tornado sweeps through the town, heading directly for the concert in the park. The audience and the benches flee the concert in a panic as the tornado devours everything in its path. Donald stands around, confused as to why everyone is running away, until he sees the tornado bearing down and tries to hide by climbing up a tree, only to have the tornado braid him within three tree trunks. The orchestra continues to play with Mickey conducting,as they are dramatically pulled up into the storm, seemingly oblivious to their peril. As they reach the climax of the piece, they stop in midair and are once again set down to the ground for a triumphant finish. The only audience member remaining, however, is Donald, who once again tries to take over with Turkey in the Straw, only to have a tuba land on his head. 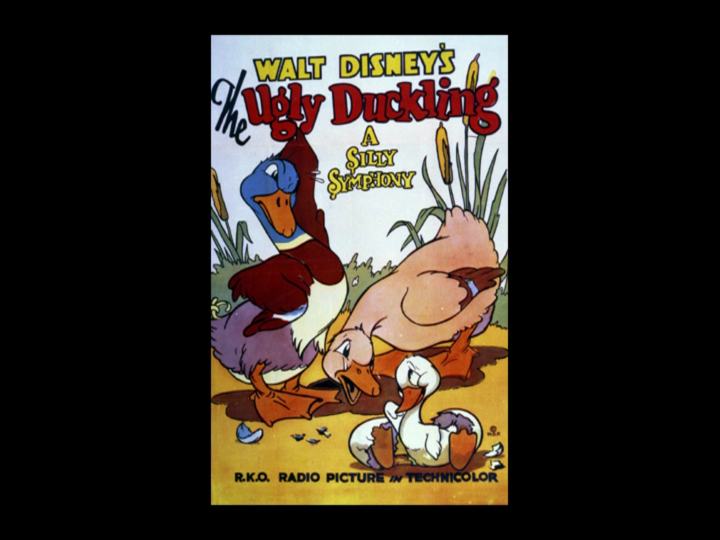 Posted in Uncategorized and tagged 1930s, Color, Donald Duck, Mickey Mouse, Short film. Bookmark the permalink.